This easy and healthy Sweet Potato, Chickpea and Spinach Curry is a 30 minute one pot wonder! This vegan and gluten-free dish uses yellow curry paste and coconut milk as a base to make a seriously delicious and creamy curry. I recently did a poll on Instagram Stories to see what types of recipes you guys wanted to see more of and there was a resounding “YES PLEASE” for more quick dinners and one pot dishes. So here’s one that ticks BOTH of those boxes – Sweet Potato, Chickpea and Spinach Curry. It’s ready in 30 minutes and it’s all done in just one pot. The combination of flavours work so well together and I love that I even snuck a bit of greenery in there for good measure. Serve this curry on it’s own or with rice but do yourself a favour and add crushed peanuts on top for some crunch. Seriously. It’s SO good. It’s made in one pot – less washing up! It’s perfect for Meatless Monday. Sauté the onion, garlic and ginger in a large pot. Add sweet potato, capsicum /bell pepper, carrot and chickpeas to the pot and cook for 1 minute. Add everything else (except for the spinach) to the pot – coconut milk, curry paste, soy sauce and water. Simmer until the sweet potatoes have cooked and the sauce has thickened. Stir spinach through the curry until wilted. I love to serve this curry on top of a bed of basmati rice but brown rice would work well too. You could even serve it with cauliflower rice for a low carb version. I also like to sprinkle some crushed peanuts on top for extra crunch. If you’ve tried this Sweet Potato, Chickpea and Spinach Curry I’d love to hear how you enjoyed it! Pop a comment and a star rating below! You can also FOLLOW ME on FACEBOOK, INSTAGRAM and PINTEREST to keep up to date with more delicious recipes. Heat oil in a large saucepan on medium-high. Add onions and cook, stirring, for 2 minutes or until softened. Add garlic and ginger and cook for another 30 seconds. Add sweet potato, capsicum / bell pepper, carrot and chickpeas to the saucepan and cook for 1 minute, stirring constantly. Add coconut milk, curry paste, soy sauce and water to the saucepan and stir to combine. 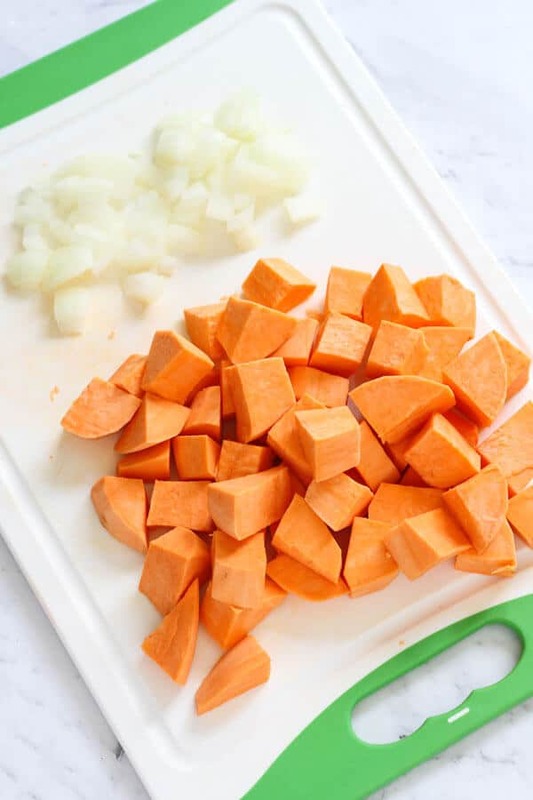 Bring to boil, then reduce heat to a simmer for 20 minutes, or until the sweet potato is cooked fully. Stir baby spinach through curry until wilted, then serve either on it's own or on top of rice with a sprinkle of peanuts on top. Recipe first published May 28, 2018. Post updated April 17, 2019 with added photos and tips. No change to the recipe. Nutrition information is from a nutrition calculator and is based on one serve without rice. Hi, can you use curry powder instead of paste? Thanks! Is it okay to use Red or Green curry paste in place of the Yellow? I couldn’t find any in my grocery store. Go for it 🙂 I’d try the red curry paste, although it is a little spicier than yellow so if you don’t love spicy, green may be best. Made this last night and everybody loved it including my fussy mother in-law and carnivore husband ?. Toasted peanuts on top added a delicious crunch. That’s actually one of the highest compliments! My husband is fussy as and if he likes a meal I consider it a universal win 🙂 Toasted peanuts sound like a perfect addition! Add coconut milk, curry pasta… I think you mean to say curry paste! I’ve always loved your sweet potato, lentil and chickpea curry so when I saw this recipe I knew I had to give it a try. Easily made it’s way onto our family’s weekly meal plan – thanks Cassie.